Subject: The first 114 pages describe the Greek islands, the flora and fauna. 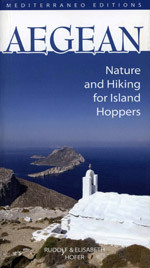 The rest of the book has detailed hiking path descriptions of the islands of Serifos, Sifnos, Kimolos, Folegandros, Paros and Antiparos, Naxos, Amorgos, Kos, Nisyros, Tilos, Symi, Rhodes, Samos, Fourni and Ikaria. Other features: A small map for each walk. Size: H 21,5 Χ W 12 cm. The Aegean - the island world of the Greeks - is a source particular fascination: sun and sea, natural environment and culture, entertainment and Greek hospitality. 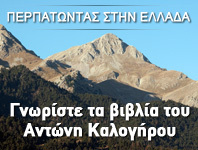 Over the last few years the number of people who go hiking οη the Aegean islands has grown steadily. Kalderimia and Monopatia are increasingly being designated as hiking paths and the volume of literature about them is increasing. Α hiking holiday in the Aegean is particularly attractive when it involves 'island-hopping'; this offers the opportunity to get to know the islands, each of them stamped with its own unique character, and to enjoy their infinite variety. This roaming lifestyle is the subject of ''Aegean -Nature and hiking for island - hoppers''; which describes a total of 48 selected routes οn 16 Aegean islands. The main purpose of this book is to draw the attention to the diversity of plants and animals. The biodiversity of the Aegean islands is particularly rich: circum-mediterranean representatives meet with species which originate from the Balkans and the Near East, and their number is further enhanced through numerous endemic species which developed in isolation after the lce Age. However, only a small fraction of the several thousands of these species can be introduced through illustrations and notes. Ecological cohesions in typical Mediterranean habitats, the interesting behavior of animals, the importance of some pIants for Man, and traces of oId agricultural practices constitute the reading material for a holiday of discovery, hiking or walking through the natural landscape.